I was going to make one but I found this for cheap so why not it's 410 grams and it fit's inside my tarp bag with the tarp. It was the net only part of this, I guess the buyer only wanted the fly. It is an easy setup. I used four pegs and a mini carabiner. 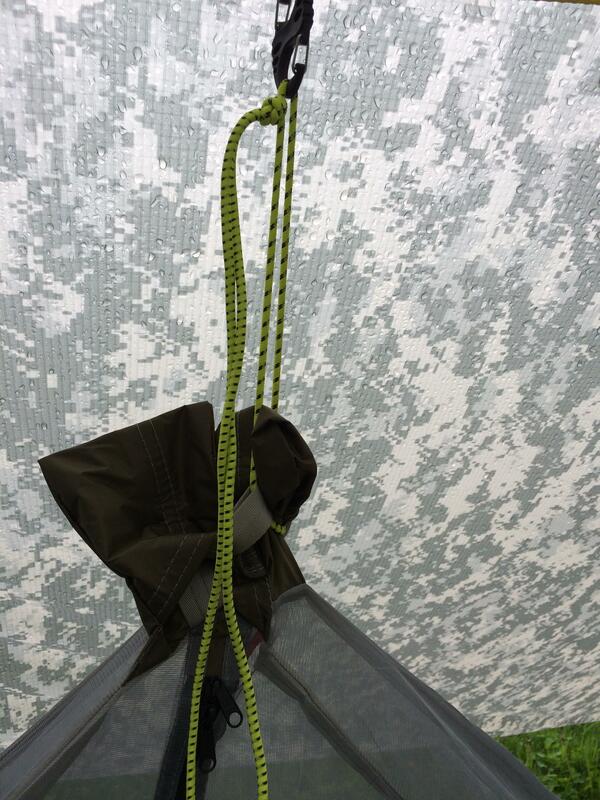 I could have tensioned all four corners right to the tarp tie outs so the bathtub wall stood up high and taut. I thought the single biner was enough. There is a hook inside the peak for hanging a light. and a loop in one corner inside near your head, not sure why though. It is small and sort of claustrophobic as the netting is close to your face laying down. With your eyes closed you don't even know it. It does fit inside the tarp fine. 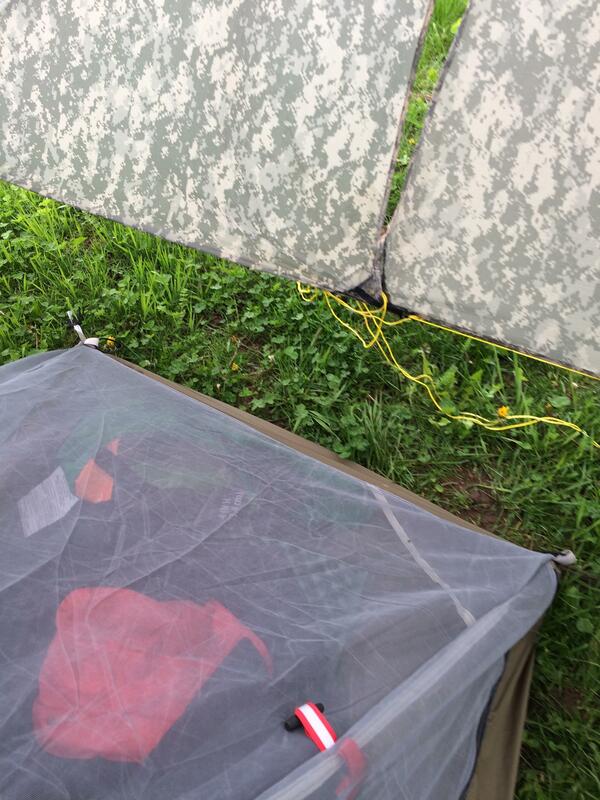 It can use poles in the sewn heavy duty pockets to support the net and that may be better. I did have some leakage. I'm not sure if the ridge line seam leaked or if it ran down the zing it, because I didn't add a water break. I slept through it. Just some droplets so maybe even condensation from me. I'd know if it didn't rain last night. Overall it is a bug free sleep with very little added weight. The down side is it's not going to be compatible with the hammock as an under side protector / bug net. I think I can modify the one I started, to work as I want it to. Either way I have options. Love the military bag but that inflatable pillow from the dollar store won't keep the plug in the fill nozzle. It immediately slides out and goes flat. 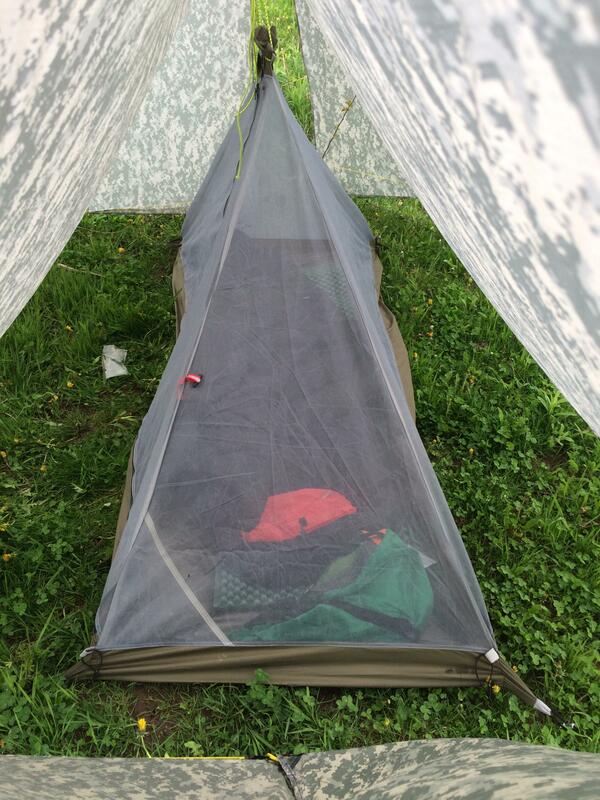 Re: A review, sort of, new net tent. That looks like a useful summer tent when the bugs are out. It doesn't look like the link though, at least to me. Is this one also designed to use trekking poles for support? yes. The two dark green tabs where the yellow bungee cord is, are the pockets for the poles. You have to scan through to the fourth picture from last at that link. I couldn't get a link to that picture to share here. last night no drips. so I'll seal the seam and get a water break on the ridge line. I do however now have some nasty slime snot gobbed up in spots on the bottom. Time to break out the borax!! Great post, I've been looking for a new backpacking tent. I hauled up a 6 lbs "light" tent a few weeks ago, total bag weight was 60 plus pounds and it was torture. I'm trying to shave out ounces anywhere I can. I remember when I first heard people shaving ounces I thought, it's just a few ounces- it can't matter that much. BOY WAS I WRONG. every ounce matters, to me at least. If anyone is interested in a tarp and net tent combo I found this and think it would be much nicer. It has an end door and a side door. It's a much better option in my opinion. I may order one of these myself.